Baldness is a physical characteristic overwhelmingly associated with men, so when it affects women it is often viewed as an embarrassing condition. Though there are many possible causes of female hair loss, some women become ashamed of their physical condition and won’t seek any sort of help for it. This is unfortunate because there are treatments for female baldness but women must be able to take control of their health and seek answers from a medical professional in order to access many of them. There are also many at home solutions for handling female baldness, so that even if treatments provide less than anticipated results women can still feel as though they have some control over the situation. 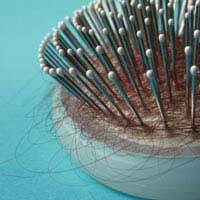 There are many reasons women may be experiencing baldness or hair loss. For some women hair loss is hereditary, often associated with a production of androgen hormones (such as testosterone). Polysistic ovary syndrome has also been linked to female hair loss, as have autoimmune conditions, thyroid disorders, blood disorders like anaemia and an inflammatory condition called alopecia which results in hair loss. Hair is also known to fall out following pregnancy, surgery, stress, changes in diet, the taking of certain supplements, as a side effect of some medications. Treating female baldness and hair loss usually requires treating the underlying health condition, for example increasing iron intake for women who are anaemic or regulating a thyroid disorder. For women who find a correlation between their lifestyles and their hair loss, behaviour modification may be required in order to break old habits and replace them with new habits. A healthy diet, vitamin supplements, even different hair care strategies might also help treat female hair loss. In the event that hair loss is a known side effect of medications, other pharmaceuticals or different doses may alleviate the problem. A medical professional will only be able to recommend treatments once (s)he understands the underlying or contributing causes to female hair loss, however, so being truthful is imperative to handling this condition. Many medical professionals believe that more women than ever are affected by hair loss today. This means there is nothing new about your situation nor anything for which you should feel embarrassment. Contact your GP first about your hair loss and be prepared to tell him or her about when you first noticed it, how often you lose hair, how much hair you notice losing each day, if there are any new medications or changes to your diet, exercise of lifestyle which may be affecting your hair, if you have been under any extra stress and anything else you can think of related to your hair loss. If you do believe medications might be the cause of your hair loss be sure to write down the names and your dosages so that your GP knows exactly what you are taking, how often and at what level. In addition to prescribed treatments for female baldness and hair loss, there are also measures women can take at home to help handle the problem. Speak with your hair stylist to find out more about the type of shampoos, conditioners, treatments and products which will work best with your hair. Avoid over-processing your hair with heat and chemicals. Try to keep your hair covered while in chlorinated water. Use loosely wrapped scarves or hats which are not too tight to cover your hair as needed. A good rule of thumb is to be kind to the hair you have left, and see if you can encourage new growth with this gentler methods of care. Handling female baldness and hair loss usually means seeking professional help to investigate underlying or contributing conditions. Knowing common causes of female hair loss, treatments for baldness and hair loss, how to approach medical professionals for help and how you can take care of your hair at home should all help you handle female baldness and hair loss as best you can.